CBI - China: Day 86 of 154 of the Japanese Invasion of Manchuria. CBI: The Sian incident in China; Chiang is kidnapped by the Manchurian warlord Yang. Spain: Day 149 of 985 of the Spanish Civil War. CBI - China: The USS PANAY, a gunboat patrolling the Yangtze River in China, is attacked and sunk by Japanese planes, turning US opinion against Japan. The American gunboat PANAY was anchored in the Yangtze River outside Nanking (now known as Nanjing), China. It was a flat-bottomed craft built in Shanghai specifically for river duty, serving as part of the US Navy's Yangtze Patrol in the Asiatic Fleet, which was responsible for patrolling the Yangtze River to protect American lives and property in China. On the morning of the 12th, the Japanese air forces received information that fleeing Chinese forces were in the area in 10 large steamers and a large number of junks. The PANAY and three Standard Oil tankers came under attack from Japanese naval aircraft. The PANAY was hit by two of the eighteen 132 lb bombs dropped by three Japanese bombers. It was also strafed by nine Japanese fighters. Four men aboard the PANAY were killed and 43 sailors were wounded. The oil tankers were also destroyed and the captain of one was killed, as were many Chinese civilians. Japan and the United States were not at war at the time. The Japanese claimed that they did not see the American flags painted on the deck of the gunboat, apologized, and paid an indemnity. News of the attack caused US opinion to turn against the Japanese. CBI - China: Day 159 of 2,987 of the 2nd Sino-Japanese War. Day 4 of 54 of the Battle of Nanking. Spain: Day 514 of 985 of the Spanish Civil War. Spain: Day 879 of 985 of the Spanish Civil War. CBI - China: Day 524 of 2,987 of the 2nd Sino-Japanese War. Day 62 of 81 of Japan's Operation GUANGDONG. Atlantic: Two German cruisers, accompanied by five destroyers, are damaged by torpedoes from the British submarine HMS SALMON. Finland: Day 13 of 105 of the Russo-Finnish War. In central Finland, Finnish troops inflict heavy casualties against the Soviet troops at Tolvajarvi. CBI - China: Day 889 of 2,987 of the 2nd Sino-Japanese War. Day 28 of 381 of the Battle of South Guangxi. ETO - UK: Day 98 of 258 of the Blitz. Sheffield is heavily bombed by the Luftwaffe. 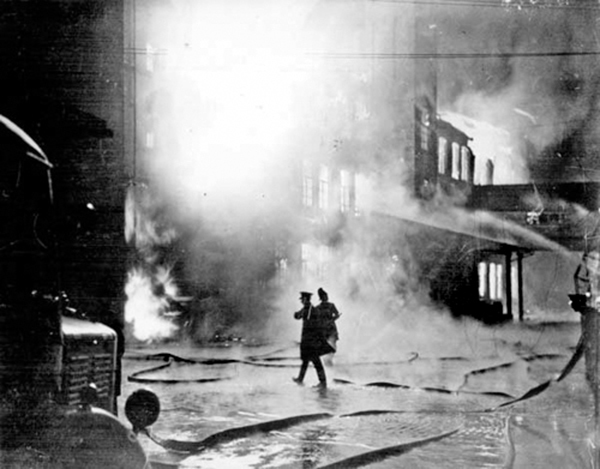 This night, and another to follow on the 15th, come to be known as the Sheffield Blitz. Over 660 people are killed, 1,500 injured and 40,000 made homeless. In 1940 Sheffield was a city of about 560,000 people that contained many steel and armament heavy industries. The Vickers works was host at the time to the only drop hammer in the country, capable of forging crankshafts for the Rolls Royce Merlin engine which powered the Supermarine Spitfire fighter plane and later in the war the Avro Lancaster bomber. Hadfields steelworks was the only place in the UK at that time where 18-inch armor piercing shells were made. Thus, Sheffield was a logical target for German bombing raids. As was the case for Allies and Axis alike, accuracy was very difficult to achieve. The majority of the bombs fell on the city center and residential areas. King George VI and Queen Elizabeth toured the city soon after the raids to inspect the damage and boost morale amongst survivors. Prime Minister Winston Churchill also toured the blitzed city, speaking through loudspeakers to a 20,000-strong crowd in Town Hall Square and giving his signature "V" for "Victory" sign. MTO - North Africa: Day 4 of 63 of the UK's Operation COMPASS, their campaign in North Africa against the Italian troops in Egypt and Libya. East Africa: Day 186 of 537 of Italy's East African campaign in the lands south of Egypt. CBI - China: Day 1,255 of 2,987 of the 2nd Sino-Japanese War. CBI - Thailand: Day 73 of 221 of the Franco-Thai War (Vichy France vs Thailand). Russian Front - North: Day 96 of 872 of the Siege of Leningrad. Russian Front - Center: Day 72 of 98 of the Battle of Moscow. Russian Front - South: Day 44 of 248 of the Siege of Sevastopol, Crimean Peninsula. MTO - Libya: Day 247 of 256 of the Siege of Tobruk. 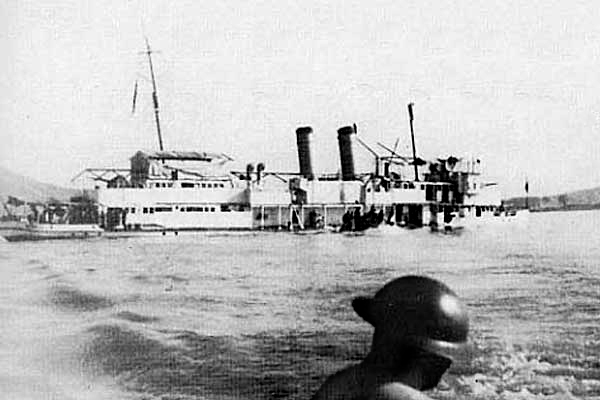 MTO - Romania: The SS STRUMA leaves Romania for Palestine carrying 769 Jews, but is later denied permission to disembark. Later it is accidentally sunk in the Black Sea by a Soviet submarine. MTO - Bulgaria: Bulgaria declares war on both Britain and the USA. Hungary and Romania declare war on just the USA. Britain declares war on Bulgaria while the US declares war on Hungary, Romania and Bulgaria. CBI - China: Day 1,620 of 2,987 of the 2nd Sino-Japanese War. Day 5 of 18 of the Battle of Hong Kong. CBI - Malaya: Day 5 of 55 of the Battle of British Malaya. PTO - Marshall Islands: Day 5 of 17 of the Battle of Wake Island, aka the Alamo of the Pacific. PTO - Philippines: Day 5 of 152 of the 1st Battle of the Philippines. ETO - France: US 8th Air Force heavy bombers attack Rouen-Sotteville and Abbeville. Russian Front - North: Day 461 of 872 of the Siege of Leningrad. Russian Front - North: Day 24 of 59 of the Battle of Velikiye Luki, near Leningrad. This stalemate does help ease the siege a little, but mostly it keeps German troops from being sent to other fronts. Russian Front - North: Day 222 of 658 of the Siege of the Kholm Pocket, USSR lays siege to the Kholm Pocket but the Germans hold out for a about a year and a half. Russian Front - Center: Day 19 of 21 of the Battle of Sychevka, Russia. Russian Front - Center: Day 18 of 26 of the 2nd Battle of Rzhev-Sychevka, Russia, launched by the Soviets as Operation MARS. Russian Front - Center: Day 18 of 22 of the Battle of Belyi, Russia. Russian Front - Center: Day 18 of 29 of the Battle of Molodoi Tud River, Russia. Russian Front - South: Day 113 of 165 of the Battle of Stalingrad, bloodiest battle in human history. Russian Front - South: Day 1 of 12 of Germany's Operation WINTER STORM, another failed attempt to take Stalingrad. Russian Front - South: Day 1 of 69 of the USSR's Operation LITTLE SATURN, a successful drive into the Northern Caucasus and the Donets Basin pushing the Axis troops out. MTO - Algeria: The 1,500 ton destroyer HMS PARTRIDGE is sunk off the coast of Algeria by U-565. MTO - Tunisia: Day 26 of 178 of the Battle of Tunisia. US 12th Air Force provides Allied air support. MTO - Italy: US 9th Air Force RAF Liberators attack the dock area at Naples. CBI - China: Day 1,985 of 2,987 of the 2nd Sino-Japanese War. PTO - Alaska: Day 189 of 435 of the Battle of Kiska, Aleutian Islands. PTO - Malaya: Day 297 of 357 of the Battle of Timor Island, a long guerrilla war ending in Japanese victory. PTO - New Guinea: Day 24 of 66 of the Battle of Buna-Gona. PTO - Solomon Islands: Day 128 of 187 of the Battle of Guadalcanal. ETO - France: Rommel takes command of German Army Group B, which covers the entire coastal defenses from the Netherlands to the Bay of Biscay. ETO - Germany: Day 25 of 135 of the Battle of Berlin (RAF bombing campaign). Essen is attacked by 18 Mosquitos and Düsseldorf by nine more. Russia: A Czech-Soviet treaty of friendship is signed in Moscow. Russian Front - North: Day 826 of 872 of the Siege of Leningrad. Russian Front - North: Day 587 of 658 of the Siege of the Kholm Pocket. USSR lays siege to the Kholm Pocket but the Germans hold out for a about a year and a half. Russian Front - South: Day 111 of 122 of the Battle of the Lower Dnieper River, USSR. CBI - China: Day 2,350 of 2,987 of the 2nd Sino-Japanese War. Day 41 of 49 of the Battle of West Changde. PTO - New Guinea: Day 85 of 219 of the Battle of Shaggy Ridge. PTO - New Guinea: Day 82 of 162 of the Battle of the Huon Peninsula. PTO - Solomon Islands: Day 42 of 295 of the Battle of the Bougainville Islands. ETO - France: Day 134 of 284 of the Battle of Brittany. ETO - France: Day 89 of 236 of the Siege of Dunkirk. ETO - Germany: Day 85 of 145 of the Battle of Hürtgen Forest. ETO - France: The underground V-weapon factory at Wittring is captured by the US 3rd Army. ETO - Germany: US 8th Air Force B-17s attack at Merseburg and Darmstadt while B-24s bomb at Hanau, Aschaffenburg, Gelnhausen, Friedburg, and Dieburg. Russian Front - Finland: Day 89 of 223 of the Lapland War. Finland and Russia have joined forces to kick the Germans out of Finland's most northern province. Russian Front - Center: Day 59 of 206 of the Battle of the Courland Pocket in Latvia. Russian Front - Center: Day 52 of 99 of the Siege of Memel, a border town of Lithuania and East Prussia. Russian Front - South: Day 45 of 108 of the Battle of Budapest, Hungary. MTO: US 15th Air Force B-17s and B-24s bomb at Blechhammer, Germany, and at Moravska and Ostrava, Czechoslovakia. CBI - Burma: Day 256 of 302 of the Chinese Salween Offensive. CBI - Burma: Day 29 of 31 of the Battle of Bhamo. CBI - China: Day 2,716 of 2,987 of the 2nd Sino-Japanese War. Day 240 of 259 of Japan's Operation ICHI-GO. PTO - New Guinea: Day 351 of 597 of the Battle of New Britain. PTO - New Guinea: Day 235 of 481 of the Battle of Western New Guinea. PTO - Philippines: Day 54 of 299 of the 2nd Battle of the Philippines, aka the Liberation of the Philippines or the Philippines Campaign. PTO - Philippines: Day 54 of 73 of the Battle of Leyte. PTO - Philippines: Day 32 of 41 of the Naval Battle of Ormoc Bay.